Video clips from different parts of the world are recorded at different frame rates. 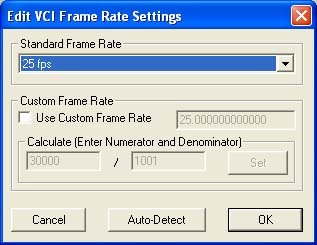 Video recorded in NTSC generally plays at ~29.97 frames per second, PAL video at 25 frames per second, and film at 24 frames per second. Ots Studio will automatically determine the frame rate based on the source material, however if the frame rate was determined incorrectly by Ots Studio, you can adjust it as required. Note: You should not modify the frame rate unless you know what you are doing!